Singapore Property - Looking to buy or rent Singapore property? Searching for rental condominium in Sentosa or Marina Bay? Search residential and commercial property for rental or sale in our Singapore Property Classifieds. You can use Search by Location to find all properties near your current location or properties nearest to your office or your child's school. Alternative you can Search by Amenity to find properties nearest to any MRT Station, International School and Primary School. Private condominiums and apartments are private property where residents share the common compound, land of the property and facilities. Condominiums are the preferred choices for most expatriates. They come in various sizes, ranging from low-rise blocks to extensive high-rise condo. The units in these properties range from studio, 1, 2, 3 and 4-bedroom units, penthouses. Condo and apartment start from as small as 500 square feet to as large as 8,000 square feet. Apartments and condo are strata-subdivided housing units, with the common areas owned and managed by a Management Corporation. Hybrid housing forms such as townhouses, cluster housing and strata-bungalows also come under the strata-subdivision arrangement. There are clearly-defined planning guidelines governing each of these property types. Most condos come with good-quality finishes, luscious landscaping, basement car park and full recreational facilities such as clubhouse, children's playground, gymnasium, swimming pool, squash, tennis courts, and sometimes even a putting green. Most developments have 24-hour security surveillance, intercom systems and some condos even have home automation systems. APARTMENT - The compound has smaller land area compared to Condominium. May not have recreation facilities. CONDOMINIUM - The compound has bigger land compared to Apartment and usually has recreation facilities. 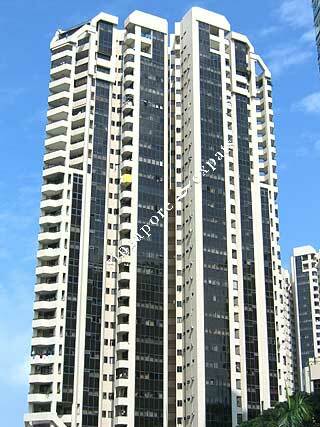 EXECUTIVE CONDOMINIUM - Condominium restricted by HDB's rules and regulations on Rental & Sale. PENTHOUSE - Biggest unit in the Apartment or Condo block. Usually on the top floor with two levels. TOWNHOUSE - Apartment with ground level entrance and usually is 2 to 4-storey high. WALK-UP APARTMENT - Low rise apartment without a lift or recreation facilities. BUNGALOW - Free standing house with no shared wall with others except the fence. CLUSTER HOUSE - Strata titled landed house with shared compound and recreation facilities. SEMI-DETACHED - A pair of houses, two houses joint side by side. TERRACE HOUSE - A row of houses joint side by side, may be corner or intermediate terrace. * Please note that Singapore Government has imposed restrictions on foreign ownership of private residential property such as landed houses in Singapore. Please refer to Singapore Land Authority website for more information. B1 LIGHT INDUSTRIAL - B1 Industrial space zoned by URA for light industries and trades. B2 HEAVY INDUSTRIAL - B2 Industrial space zoned by URA for heavy industries and trades. BUILDING - Entire Commercial / Industrial building. FACTORY - Industrial space for heavy or light industries. FOOD & BEVERAGE - F & B space, restaurants, cafes. HDB SHOP - Shop space within a HDB block. LAND - Bare land or land with an old building. OFFICE - Office space in commercial office buildings or shop house. MEDICAL SPACE - Medical Space for medical practitioners & medical facilities. SHOP - Shop space for retail business in malls or shophouse. SHOPHOUSE - A row of low-rise shops joint side by side with a living quarter / office above them. WAREHOUSE - Space for storage. May include some office space. These types of property listed below are either conservation shophouses or colonial houses and bungalows. A good example will be shophomes like Townerville. Kindly contact us if you are interested in them. More than 80% of Singaporeans live in public housing. These apartments are mostly owned by the occupants. These HDB apartments are located in housing estates, which are self-contained towns with clinics, schools, supermarkets, food centres, as well as sports and recreational facilities. They are known as HDB flats because they are built and maintained by the Housing and Development Board (HDB). For the classification of HDB flats, the living room is counted as one room. 2-Room HDB Flat - 1 bedroom with a built-in area of about 45 sq m or 485 sq ft.
3-Room HDB Flat - 2 bedrooms with a built-in area of about 70 sq m or 754 sq ft.
4-Room HDB Flat - 3 bedrooms with a built-in area of about 90 sq m or 969 sq ft.
5-Room HDB Flat - 3 bedrooms with a built-in area of about 110 sq m or 1,184 sq ft.
Jumbo HDB Flat - 6 bedrooms which is joint by two 3-Room flats. Executive Apartment (HDB EA) - 3 bedrooms with built-in area of about 150 sq m or 1,615 sq ft.
Executive Mansionette (HDB EM) - Same as Executive apartment, except it has two levels.